Hello and welcome to our tour of the unusual, exciting and deadly aspects of the elements that make up the world around us. We're kicking off our journey through the periodic table with a chemical that sometimes masquerades as diamond but is equally at home in the core of a nuclear reactor or even in an ironworks. To tell the story of this mysterious entity which is otherwise known as zirconium, here's chemist and award winning author John Emsley. Zirconium. Wear it flashing on your finger, or unseen within your frame, it holds the key to nuclear energy, and it's got a gem-like name. It's zirconium. The name zirconium comes from the Arabic word zargun which refers to a golden-hued gemstone known since Biblical times called zircon. Today artificial gems are made from zirconium oxide known as cubic zirconia and they sparkle with more brilliance than diamond although they are not as hard. 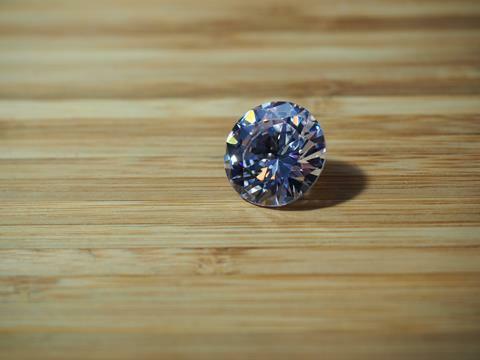 What distinguishes them from real diamond is their higher density of 6.0 g cm-3 compared to diamond's 3.52. 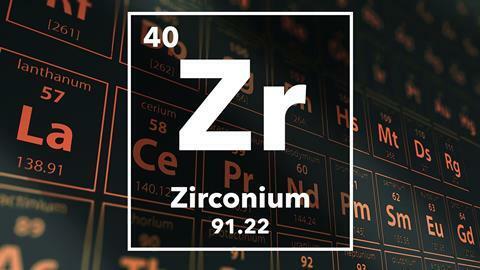 Zirconium is abundant in S-type stars in which heavier elements are formed by neutron capture. Traces are also present in the Sun. Rock brought back from the moon was found to have a surprisingly high zirconium content. Down here on Earth zircons has shown that life might have started much earlier than once thought. These were found in Australia in the year 2000 were 4.4 billion years old, and their oxygen isotope ratio of O16/O18 showed they could only have been formed when there was liquid water on the surface of the Earth, and this was nearly 500 million years earlier than previously assumed. In the Middle Ages colourless gemstones of zircon were thought to be an inferior kind of diamond, but that was shown to be wrong when a German chemist, Martin Klaproth (1743-1817), analysed one in 1789 and discovered zirconium. Klaproth was unable to isolate the metal itself. That was achieved in 1824 by the Swedish chemist J?ns Jacob Berzelius but there was little use for it or its chemical compounds, and so it languished for a century or more. Today this element is widely used, as zircon, as zirconium oxide and as the metal itself. Zirconium is to be found in ceramics, foundry equipment, glass, chemicals, and metal alloys. Zircon sand is used for heat-resistant linings for furnaces, for giant ladles for molten metal, and to make foundry moulds. Mixed with vanadium or praseodymium zircon makes blue and yellow pigments for glazing pottery and tiles. Zirconium oxide is used to make heat resistant crucibles, ceramics and abrasives. A red-hot crucible made from it can be plunged into cold water without cracking. Zirconium oxide is to be found in ultra-strong ceramics that are stronger and sharper even than toughened steel and are used for knives, scissors and golf irons. Production of pure zirconium oxide is almost 25000 tons per year, and it also goes into various chemicals that end up as cosmetics, antiperspirants, food packaging, and even fake gems. The paper and packaging industry is finding zirconium compounds make good surface coatings because they have excellent water resistance and strength. Equally important is their low toxicity. Zirconium metal has an oxidised surface which is both hard and impervious to chemical attack making it ideal not only for chemical plants but for body implants such as hip replacement joints. Zirconium-aluminium alloy is used for top of the range bicycle frames because it combines strength and lightness. 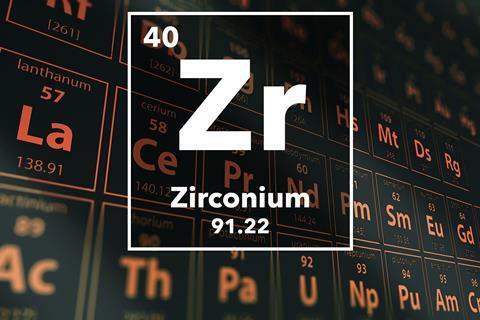 Zirconium metal had some hidden assets which suddenly brought it to prominence in the late 1940s; it was found to be the ideal metal for inside nuclear reactors and nuclear submarines. It does not corrode at high temperatures, nor absorb neutrons to form radioactive isotopes. Even today the nuclear industry buys almost all of the metal that is produced and some nuclear reactors have more than 100 kilometres of zirconium tubing. Zirconium is used to make the cladding for uranium oxide fuel elements. As mined, zirconium contains 1-3 per cent of hafnium, which is chemically very similar, and although it is difficult to separate the two elements this has to be done for the metal used in the nuclear industry because hafnium absorbs neutrons very strongly. Finally, we have two zirconium materials with extreme properties, one which it displays when very cold, the other when it is heated to high temperatures. The first is a zirconium-niobium alloy which becomes superconducting below 35 Kelvin (-238°C) in other words it will conduct electricity with no loss of energy. The second is zirconium tungstate (ZrW2O8) which actually shrinks as you heat it up, at least until it reaches 700°C when it decomposes into the two metal oxides. John Emsley unlocking the secrets of element number 40, zirconium. And you can find out some more about John's favourite elements in a series he has written for the RSC's Education in Chemistry. Next time on Chemistry in its element, life's a gas with Mark Peplow. Little did those humble cyanobacteria realize what they were doing when two and a half billion years ago, they started to build up their own reserves of energy-rich chemicals, by combining water and carbon dioxide. Powered by sunlight, they spent the next two billion years terraforming our entire planet with the waste product of their photosynthesis, a rather toxic gas called oxygen. So join us next week for a breath of fresh air and the story of oxygen. I'm Chris Smith, thanks for listening, see you next time.